Discussion in 'Packs & Accessories' started by DuneElliot, Nov 1, 2018. The night before my Collegiate Peaks Loop attempt the vertical stays in my Arc Haul bent and my only other backpacks were 400 miles away in Idaho. I had one choice; to drive the 120 miles to Colorado Springs and the REI to purchase a new backpack so I could get on the trail. 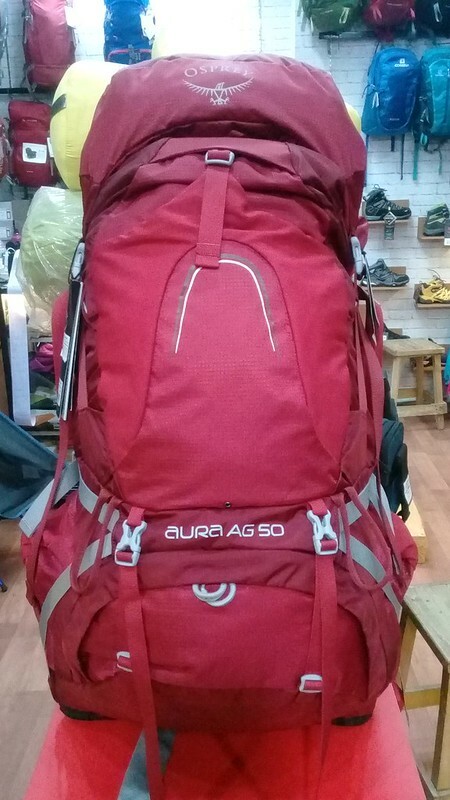 As I have my gear dialed in to my 62L (49L main compartment) Arc Haul I knew I didn’t need anything larger so the Aura 50L seemed to be a good starting place. As soon as I put the pack on it fit like a glove and kind of felt like I was being hugged from behind. It was a novel concept and feeling. Daymoth and WilliamC like this. That comfort does come with a weight cost though. Forgot to put the link in for the rest of the review....now edited and updated to included the link to the full review. It's a moot point. It may carry your tent more comfortably, but it'll increase your overall pack weight by about the weight of a tent. Might be worth it. Or not. I get the impression (perhaps wrongly?) that most 'regulars' on this site have packs well into the sub-1kg bracket, and I'm feeling a bit of a fatty at 1.1kg. Better than the 3kg monster which preceded it though. Daymoth and Snowdonia wildcamper like this. Even the burly Seek Outside Divide is lighter by a pound. 4+ pounds these days is a throwback to the ‘90s. My 2007 ULA Ohm is 21 ounces. I briefly owned an Osprey Kyte 66 which seemed well made and comfortable but was far too big for my needs. If we ever meet up there'll be 3 collies running round with ruffwear packs (Fudge now has a green approach pack). There was an interesting recent thread on whether it might be better to have a heavier backpack with a better support structure or go all out for low weight. There wasn't really a conclusion but there were quite a few came out of the woodwork with a 1.1kg ish pack with a frame and good support. I recon there is a sweet spot for beginner packs around 1.1kg and I'm very happy with my Exped Lightning 60. The thing is that that whole discussion is based on a false premise as it assumes that greater weight/lesser weight is trade off of greater comfort/lesser comfort. Of course everyone wants comfort. The goal is comfort at less weight, which is why people buy so many packs trying to find that sweet spot. Lots of people have found sufficient comfort in Arc Blasts or MLD Prophets or Atoms or whatever. The heavier packs may guarantee comfort in some ways but they are heavy, which is also guaranteed to be less comfortable. i've certainly found the above to be true - lost lots of weight by swapping the Osprey for the Gossamer Gear pack - but gained comfort also- i thought it wouldn't be such a good carry having an unframed pack but ( for me) its much nicer. Of course individual back shape, posture, walking style etc will factor in so many variables alongside, to the extend that person to person comfort comparisons are virtually meaningless. My granite gear pack (foam support, 1.1kg) is very comfortable, the montane GT (framesheet and aluminium stay 1.3kg) less so (probably because it's quite rigid), but is nicer to use. Nicer to use , as in easier to pack and unpack because its stiffer ? Or for some other reason Taz?? Yes it stands up without collapsing and the material is (seems) slightly thicker (so easier to pack) and the zipped pockets, hipbelt pockets and lid are really usefull (tho its easy to shove all manner of random stuff into these). So when I say 'nicer' that's what I meant, slightly more user friendly. I can see why DofE and such groups like these big rigid packs (and still have all sorts of stuff hanging off it ). Thanks. I also have the green Approach pack now...need to get another pack for the West Highland Way next year so both of my dogs have one. I didn't bring my old, used ones with me as they were about due for replacement anyway. Lots of collies is always fun. As far as weight vs comfort with the Osprey I think it just depends on the scenario and the hike. While I would have chosen to take my Arc Haul if I had the choice I had no issues with the extra 1lb of the Aura I ended up carrying very comfortably when we were out for 7 days (and 30lbs at the beginning of the trip) in August. It's definitely heavier than UL packs out there but it's still within the acceptable range for me. I don't have any interest in getting down into the sub 20oz frameless/unsupported packs as my gear will never be light enough for that (not with two dogs to cater for). The main question is (again and as always) : Does a 400-500g really make you slower? Of course not.It´s all in our minds. I like the feeling of a 4kg-BW and spend a lot of money to try new (and most of the time lighter) gear, but honestly: The best carrying comfort for me is my Lightwave UL 60,which outmatches my HMG and also my Atom. Still, I´m looking for weight reduction at least on my gear,but it´s a bit mental. I recon if I lost the 15kg off my body weight I'd definitely be quicker and less tired at the end of the day! I suspect many of us would find more benefit and less expence from loosing some unneeded body mass! If lighter gear works for you, great. But a 500g pack is unlikely to work unless all the rest of your gear is equally lite. And then go to 9:45 on this. For some reason this chap decided to start out on the WHW with food for the full trip.